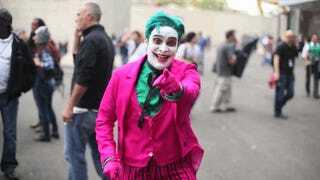 There are a lot of people in costumes having fun in this montage from New York Comic-Con 2014. Let's join them, shall we? Beatdownboogie brings us a video filled with the impressive costumes and posing hi-jinx that happened on the west side of Manhattan this year. I'm partial to the Cesar Romero version of The Joker myself. Just look at that guy. He doesn't want to watch the world burn. He just wants to party.